Europa Casino is a competitive online casino entity that was established in 2003; it is owned by Universal Entertainment Services. While initially licensed by Antigua and Barbuda, Europa is now regulated by the Malta Gaming Authority. This change affected the clientele since the Malta license would include a new list of restricted countries. Customers from the UK were transferred to another casino when this happened. Europa Casino host both download and no download options of gaming. The no download options require the installation of flash add-ons for it to launch any games in the browser. Europa also has a mobile version of its software that can be downloaded from the website. A Europa mobile app also makes playing on the go an option for Europa Casino customers. Europa play online is exciting, seamless, and most of all rewarding. Here is a full comprehensive Europa review. 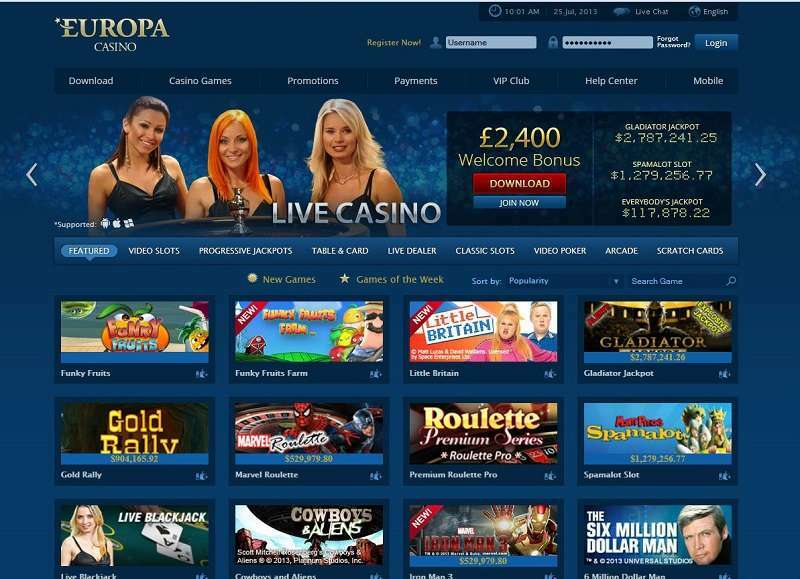 Being one of the older online casinos in the business, Europa employs the use of the largely preferred Playtech software. Playtech has been a software provider since 1999 and has become sort of a household name among gambling folk. They are known for developing games with high graphics, uninterrupted gameplay, and excellent audio quality games. In addition, Playtech’s games have been known to simulate real-life games as close as possible. Another advantage that Playtech has over other providers is the license to use Marvel characters in their games. Most would agree that Marvel has a large following and people would automatically love what is associated with Marvel. This casino has a large collection of over 500 rotational games. Of these, a few are available to play instantly with no download requirements. However, to enjoy the full Europa Casino gaming experience, one has to use the downloadable casino suite; this will avail the full range of games available at Europa including live dealer games, roulette blackjack, slot machine games, video poker, and arcade games. Slot machine games take up the largest share of Europa’s game library. You can find Classic slots, jackpot slots, and video slots on this casino’s gaming menu. Slot games all share an amazing High Definition interface with a variety of themes. Most punters have, however, taken a shine on the Marvel-inspired titles such as the Incredible Hulk, Iron Man, and Gladiator. The wide choice of slot games will avail 3, 5, and 7 reel slots for the gamer’s pleasure. Locate and play titles like Great Blue, Secrets of the Amazon, and Funky Fruit Farms. All these choices also have various bonus features including free spins and bonus round games. The jackpot slots also provide an opportunity to reap more significant rewards. The table game menu is infested with blackjack and roulette titles. There is an occasional appearance of craps, baccarat, and other table games. 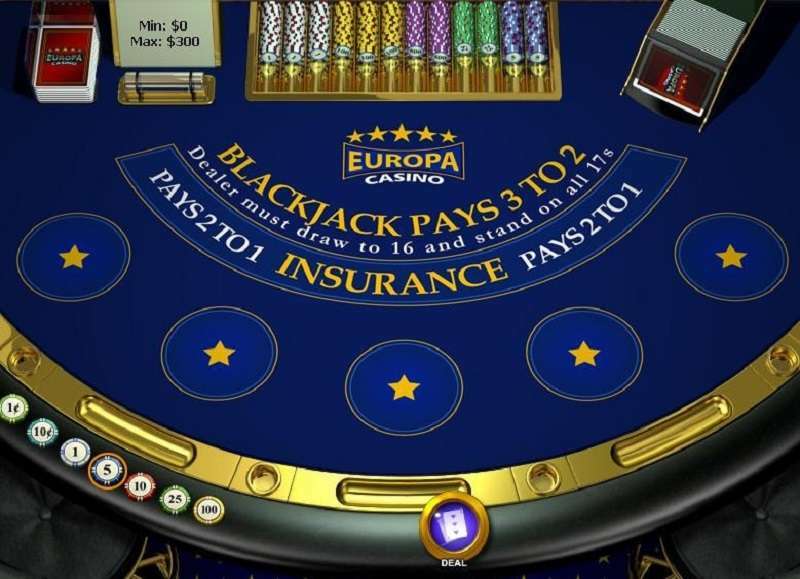 There are over ten variants of blackjack and roulette titles in Europa Casino. Blackjack has also been featured in the live dealer games with titles such as Blackjack Switch and Double Attach Blackjack gracing the menu. Both blackjack and roulette have been included in the Marvel bandwagon with each set having a title themed around the comic expert. Live Casino options afford the player the chance to experience the aura of a brick and mortar casino in their comfort zones. 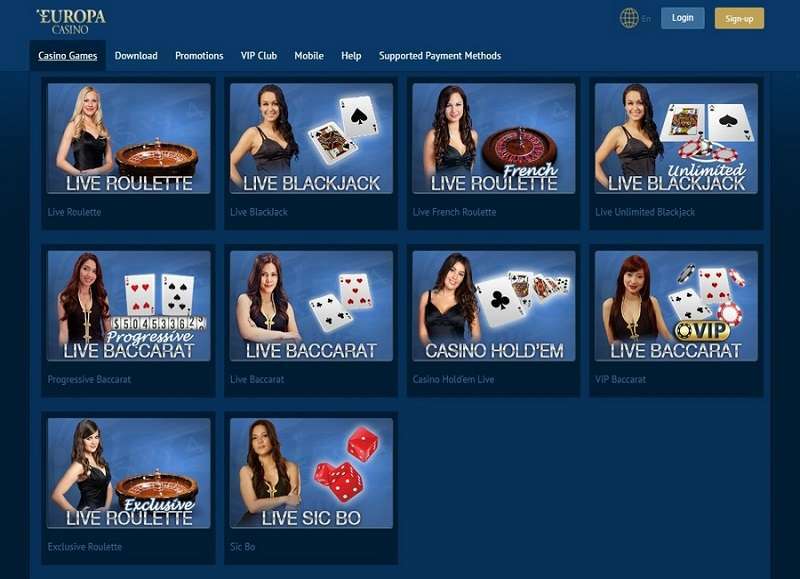 Live dealer games allow the player to interact with professional dealers and the action is streamed to the customer’s device using high definition cameras. At Europa, there is a “get to know your dealer” option that entails a bio on each of the dealers complete with interests, favourite foods, movies, books and so forth. The bio makes it easier to strike a conversation with the dealer as the game is in progress. 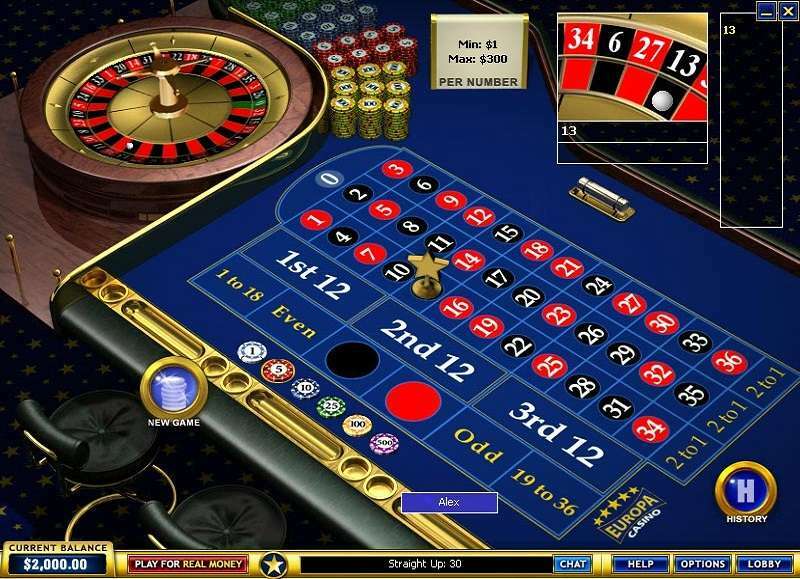 Live Casino mostly features table games like roulette and blackjack. Besides the former category, Europa has some less competitive titles in its list of games. Although they offer smaller rewards, Keno and Bingo, are two good options to pass the time on a slow day. Other games include Sic Bo, Caribbean Stud, and Red Dog. Pamela Anderson also makes a cameo in this category with Baywatch themed scratch cards available for instant cash rewards. Europa Casino goes above and beyond with its Welcome Bonus offer. Upon registration, new players can claim a bonus that is made up of two parts: a weekly loyalty bonus and monthly match up bonus for 12 months. To qualify for this bonus, a new member has to deposit a minimum of 20 Euros into their account. For every first deposit of the month, the player will be rewarded with a 100% match up bonus of up to 100 Euros. Also, 25 Euros will be credited to the customer’s account as a weekly bonus. The Europa Bonus runs for a total of 12 months with regard to the match up bonus while it runs for 52 weeks for the loyalty bonus. The welcome bonus sums up to 2,400 Euros, which can be claimed over a longer period. The extra funds can be utilised in playing any of the games in Europa Casino’s portfolio. The bonuses are subject to a wagering requirement. For casino games, the condition entails a 20-time rollover. The wagering requirements for the other sets are specified in the general terms and conditions for bonuses. As an alternative to the Welcome Bonus, high rollers may choose to claim a 50% high roller bonus. This bonus, however, does not cover the entire twelve months of the welcome Bonus; instead, it substitutes the first instalment, which is the match up bonus of up to 100 Euros. It may also be used in isolation. The High Roller bonus matches a new customer’s deposit 50% up to 500 Euros. A minimum deposit of 1000 Euros is required to qualify for this bonus. Like the welcome bonus, there is a wagering requirement attached to this reward. Before the customer withdraws any winnings accruing from the bonus, they have to wager 20 times the amount advanced as a bonus for casino games. Other games, aside from casino games, attract a 25x wagering requirement. Promotions. Every week, players may be notified through their email of exclusive bonuses and promotions. The promotions may range from game specific bonuses to free spins and deposit bonuses. Only members of Europa Casino can access these promotions. Some promotions allow casino members to access hidden games with unique promotions attached to them. Refer a Friend Bonus. This is a common bonus across the gambling business. It simply works as the name suggests; when an existing member of Europa online casino invites a friend to register, both the referrer and referee will earn a bonus. However, the bonus can only be claimed when the referee makes their first real money deposit. The referrer, on the other hand, must have already made three deposits and have an open account for 30 days. The referrer earns 50 Euros while the referee is given 20 Euros. All bonus amounts are subject to a 25-time rollover on casino games. Loyalty Points. The Loyalty program at Europa Casino is the garden variety comp point program. It is a 6 tier program that will see the gambler progress from Bronze, Silver, Gold, Platinum, Diamond, and Premier in that order. Upon registration, a new member is automatically inducted into the bronze level of the program. Placing a wager on any game earns the player a loyalty/comp point. The comp points keep accumulating as the member progresses through the six levels of the program. Each level has different perks, one better than the previous one. For instance, the bronze level offers a weekly bonus of 50 Euros while the Silver offers 75 Euros. At the highest level, a member will have a set of favours such as faster withdrawals and higher bonuses. The points earned from the VIP program can be redeemed for cash. The cash is immediately available for withdrawal. Europa Casino has a general framework that governs all bonuses. By default, all bonus amounts and the accruing winnings are subject to x25 wagering requirement for the total bonus and the deposit amount. Any wins from free spin bonuses cannot go beyond 100 Euros. Moreover, free spins are limited only to slot machine games. In case the bonus is used for wagering on roulette, all the winnings will be voided and the bonus was taken away. If there is a pending withdrawal request on the member’s account, the bonuses cannot be claimed. Bonus amounts can never be withdrawn. There is a minimum deposit limit of 20 Euros. The maximum limit varies depending on the currency and method of payment preferred. Withdrawals take more time to be processed than deposits. On average, it takes between four and seven days. However, payment by mailed checks could take up to 2 weeks. All payouts are subject to a 48-hour pending period within which a withdrawal request may be cancelled. Members of the VIP program have the advantage of faster withdrawals. There is a 9,990 Euro monthly limit on withdrawals. The maximum payout allowed on jackpots is 500,000 Euros. The casino operates under a license of Antigua and Barbuda Financial Services Regulatory Commission. Malta Gaming Authority also licenses them. The commission requires that all software used in online casinos adheres to fair industry practices and that payouts are given out regularly. The games and software at Europa are vetted by Gaming Laboratories International, which is an independent firm that tests the fairness of games. Europa Casino comes in several languages. Customer care and the software are both available in English, German, Serbian, Spanish, Portuguese, Italian, Russian, and Polish. It, therefore, suits a vast number of nationals with these global languages. The user experience is personalised for the customer’s convenience. There are little gems like financial history, which keeps track of all bets and bet times for later reference, and everyday bonus features that improve the player’s position in the casino. Members of Europa Casino are awarded bonuses of up to 15% for choosing certain payment methods over others. This bonus can be used with the welcome bonus but has its separate wagering requirements. Apart from this, there are some of the best bonuses that can be collected throughout the player’s lifetime at Europa Online Casino. Europa Casino is a marvel. It is easy on the eye, easy to navigate, and also has a great range of bonuses. It has a long-standing reputation of fairness, however, not without complaints. There have been a few disgruntled players that have lamented about delayed payouts. It is true that payments might be slower in certain instances. However, payout times have been stipulated on the website.